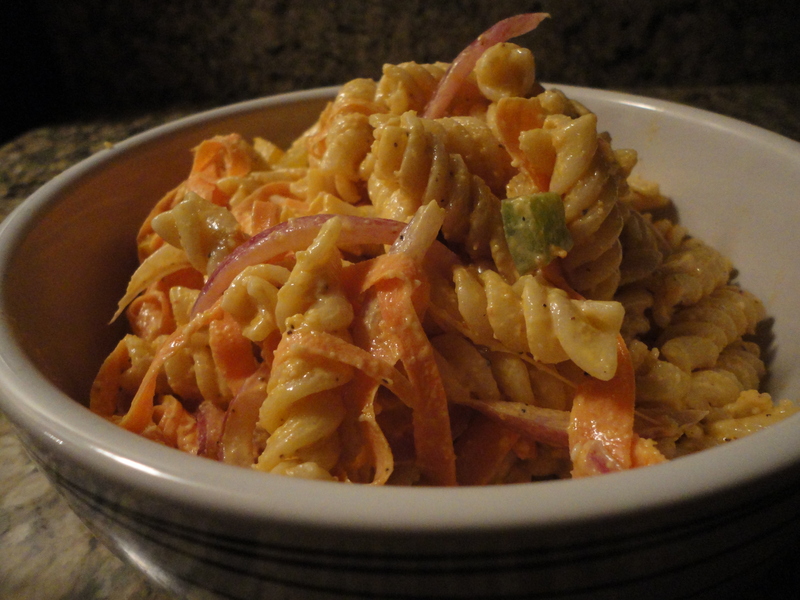 Here’s my easy and delicious recipe for a mildly spicy pasta salad. Trust me when I say the spice isn’t over the top, in fact the amount of Sriracha used gives it more of a smoky profile than spicy… If you want spice, add more, if you don’t want any at all, take out the Sriracha. Your call. It doesn’t get much easier than this recipe. Cook your pasta per the instructions on the box, then drain and mix in a large bowl with the remaining ingredients (not including the parmesan or it will start to melt) until well blended. Cover and place in the refrigerator for an hour before serving to allow the flavors to really meld. Mix in the grated parmesan and serve. See, wasn’t the crazy simple! Tags: pasta salad, perfect pairings, perfect pairings at home, sriracha. Bookmark the permalink. Just made it for my office Christmas lunch (minus onions and carrots) and it went over very well thank you!